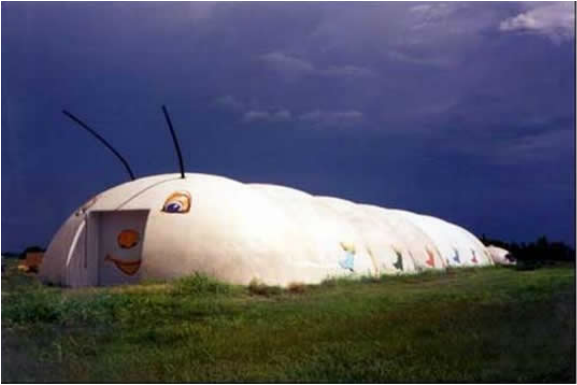 On a stretch of Interstate 35 in central Texas, between Waco and Waxahachie, is an enormous caterpillar. The curious stop to explore and discover Monolithic's Dome Village where there are dome offices, dome storage buildings and upwards of 60 domes rented out as single person dwellings--both single dome homes as well as homes made of two, three or four connected domes. The caterpillar is the manufacturing plant. I was informed that these buildings are ‘green’ in every way. They will withstand winds of 450 miles an hour. FEMA rates them as near absolute protection from hurricanes or tornados, and they have an R value of 60 or more. Their lifespan is measured in centuries since they don’t burn, rot, or get eaten by termites. I wanted to learn how to build these domes, so I decided to sign up for one of the workshops that Monolithic offers twice a year. Most people who take the workshop are hoping to learn how to build a dome for their future home. I wanted a career change and decided to follow the example of David South (Chairman and CEO of Monolithic Domes) by "building affordable housing and renting domes to those with modest incomes." After completing the course it took a while to get things rolling. First the land had to be located and purchased. There were two main requirements: accessibility and public water. Then a relationship had to be established with a bank. My local bank couldn’t handle the concept so the pavement was pounded until a bank with a broader outlook was found. Building commenced with the first eight units the beginning of the summer of 2006. The team at Monolithic can be hired to help with the construction. They will do as much or as little as requested. My plan was to do it all myself with my own crew. As with all construction, nothing ever goes totally as planned. We had our share of hiccups, but overall the domes were finished without too much difficulty. They were rented as soon as completed and, to date, they have not been empty. 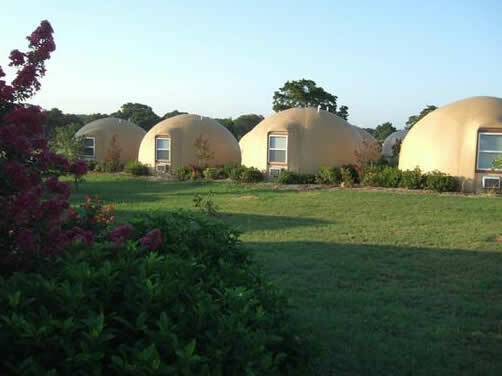 Phase II added eight more domes which were available for rent in February 2008. There were some small internal design changes in these domes as I learned what works better for me. But overall, the design provided by Monolithic is hard to beat. Phase III added 16 more units completed in June 2010, and 8 more finished in May 2011. All are identical in size and layout. The final phase, for a total of 48, has the shells completed as of Jan 2012, and finishing out is in progress. Domes hundreds of feet across can be built (e.g. schools, bulk storage, arenas or churches) but the buildings I build are 20 feet in diameter, giving a floor space of 314 square feet. There are two windows and a front door (the top half is glass) permitting plenty of light to enter. Inside, the dome has one wall dividing the bathroom from the living area. 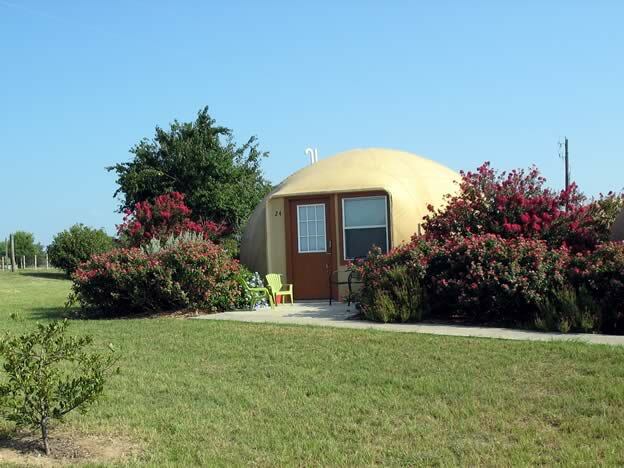 Following the example of Monolithic, I rent The Inn Place domes by the week.